Giant class have had a very busy week preparing for Cerne Bear's birthday! We have talked lots about what it's like to celebrate our own birthdays and the different things we like to do with our friends and family. We decided to make Cerne Bear's birthday very exciting and have a birthday party for him! We have been busy preparing party hats, birthday cards, invitations, party food lists, place mats and making and wrapping different birthday presents for Cerne Bear! 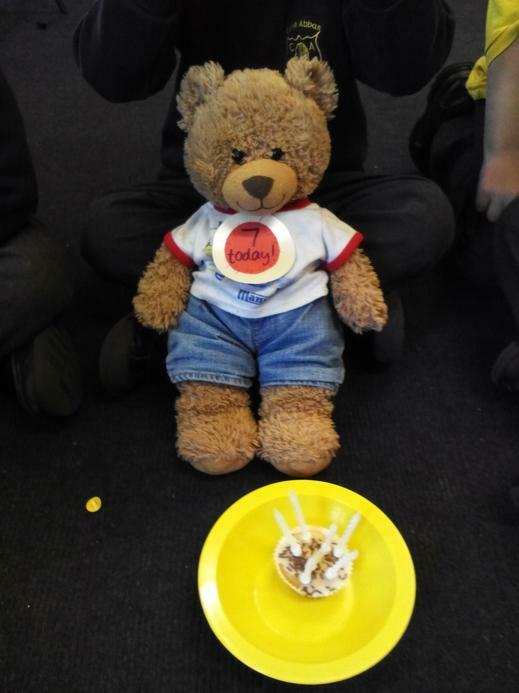 Giant class have been learning lots about the number 7, as Cerne Bear has just turned 7 years old. We have been practising how to write the number 7 and have been exploring making our own sets of 7. We have also been practising our counting skills, making sure Cerne Bear had 7 candles on his cake this afternoon! We thought carefully about the different party foods Cerne Bear would like most. We worked in groups to write a list of different foods for Miss Stephens to get ready for the party. We were listening carefully to the sounds in the words and writing the letter shapes using the sound mat. Fantastic writing Giants! This morning we were extra busy baking Cerne Bear's birthday cakes! We looked carefully at the ingredient and equipment list and followed the steps from a recipe to make our own fairy cakes. We used the scales to measure the ingredients. We measured 100 grams of butter, sugar and flour into the bowl. We had to watch the numbers on the scales and stop when we got to 100. We now know what the number 100 looks like, a one and two zeros after! We were able to spot lots of other numbers on the digital scales! 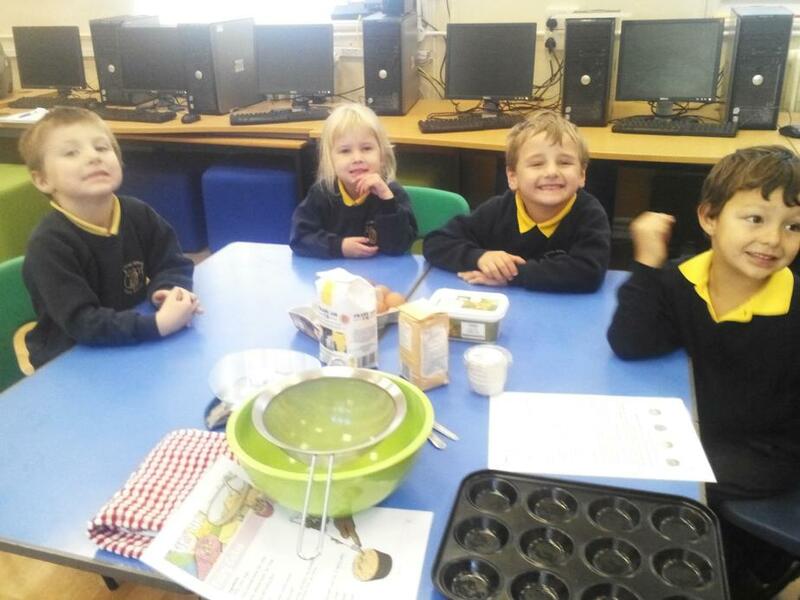 We had lots of mixing to do as all the different ingredients were added, luckily we had a few expert home bakers in the class to help us! When the mixture was ready we carefully spooned it into the case cases and put our cakes in the oven to bake. They smelt so yummy when they came out of the oven! We waited for them to cool, then decorated them with icing and sprinkles- ready for the party! Giant class had lots of fun with Cerne Bear playing party games then sitting at the table for their party food. They sang happy birthday to Cerne Bear and helped him to read his cards and open his presents. Cerne Bear says a big thank you to all of the Giants for making his birthday so special! See you all for more fun and learning next week!